Also it is worth mentioning that if you are into collecting and tittles, that if you collect 25 visuals for each of the slots (12 slots, including shirts and tabards) that you will gain the achievement Fabuleux and be awarded the tittle . Question: I have the Corsèque à la trempe de sang on a my first pally I ever made. Will it be able to enter the new transmog system even though it is no longer obtainable? and if so to what effect? i.e. can a new pally equip it? what about another class that uses polearms? In other words, if I've obtained Fracalupagus from killing Perculupagus, and have sold it, will it show up in my Transmog or not? Lance de Xuen, gear from archaeology? Réplique de Croc-de-Lion, items from promotions? Capuche ombrelune, things purchasable with currencies other than gold in-game specifically for transmog? Lance de guerrier hozen, items looted in the world as treasure? Also this goes way back to classic, will the most epic axe be available? The Whirlewind Axe Hache tourbillonnante . Not the cheap recolors, but the classic one from the lvl 30 warrior berserker stance quest chain. Will quest items for one side, such as Arc de Keeshan, be available in the wardrobe for members of the opposing faction? As in, if I played through and got the above item on an Alliance hunter, would I be able to transmog it to my Horde hunter? What about Benediction Bénédiction / Anathema Anathème ? OMG I want to use my staff again, but its on an old toon, not on my new main server. Simple question for someone on the PTR. Do Cata-quest rewards like Trancheur du légionnaire Nazgrim automatically transfer to Couperet du capitaine Taylor on an Alliance character, or do you need to do Cata quests twice to get both recolors? Is it going to be transmog-able by my level 15 Monk with his Chapeau Sombreruse taché? I earned the ability to purchase this from Gina Griffe de Tourbe after reputation grinding Vieux Patte des Hauts with my level 90 Druid Worgen? You can also buy Yack de la grande expédition and will always have transmog with you. Today, i started a DK and when i got to SW transmog vendor alot of items i got from the story line from level 55 to 59 were not registered with this new transmog system. Examples: Spallières cuirassées imprégnées de sang en saronite,Voile de sang d'assombrisseur des cieux,Harnois de guerre en saronite, Brassards cuirassés en saronite...all the second set you get from questing in the DK start area, including weapons: Lame de l'âme runique and Bardiche de la Lame d'ébène. So what's up with this? Really quick question about a certain set of weapons, namely the ones from the Argent Tournament. As there isn't a de facto "reputation" in the tournament, I perhaps thought that if I purchase a weapon with seals from the tourney, I can use it on another toon without restrictions (save level, faction, etc.) However, I purchased Claymore du prophète on my hunter, only to be unable to use it on my paladin of the same level/faction. I assume this is because she is NOT on the same "stage" of the tournament as my hunter. Is this working as intended, or a bug? Hoping not to have to joust on 5 different toons to use these rather unique weapon skins. I have a minor cosmetic issue with my transmog since 7.0.3, my Oeil de spectacteur embrasé, seems bigger then it used to be on my male pandaren. It's clipping through my ear and the lens is clipping through my nose. I compared a few old screenshots and it IS bigger now. Can this be changed somehow? It doesn't look as cool as it used too. I see cross-faction questions, but what determines which PvP gear (old or new) gets added to the same-faction account-wide collection? 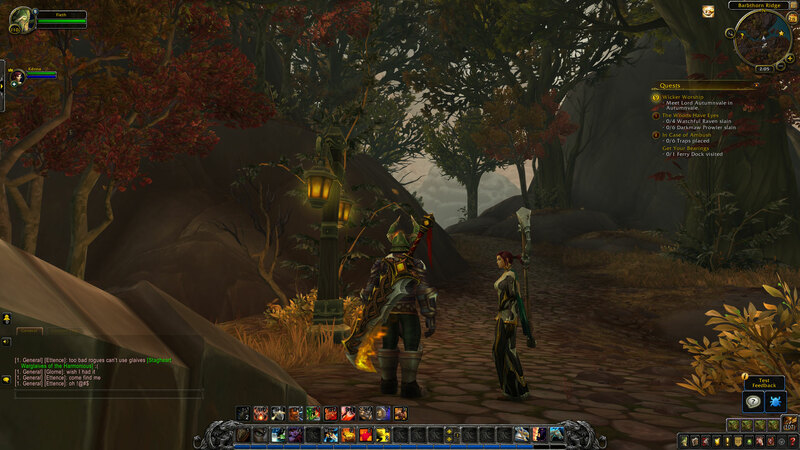 I just recently got Ceinture de victoire du gladiateur belliqueux and Heaume du gladiateur belliqueux on my Monk, but my same-faction, same-server Rogue does not have them in their collection. As a death knight, is it possible for me to go into UBRS and pick up Tranche-destin de Main-Noire, even though it has agility and is obviously a hunter weapon? As a death knight, is it possible for me to go into UBRS and pick up Tranche-destin de Main-NoireBlackhand Doomcutter, even though it has agility and is obviously a hunter weapon?